A Case to Answer is an objective and captivating study of criminal proceedings in South Australia, based on a variety of sources including personal observations and interviews, court transcripts, statements from witnesses and Hansard records. 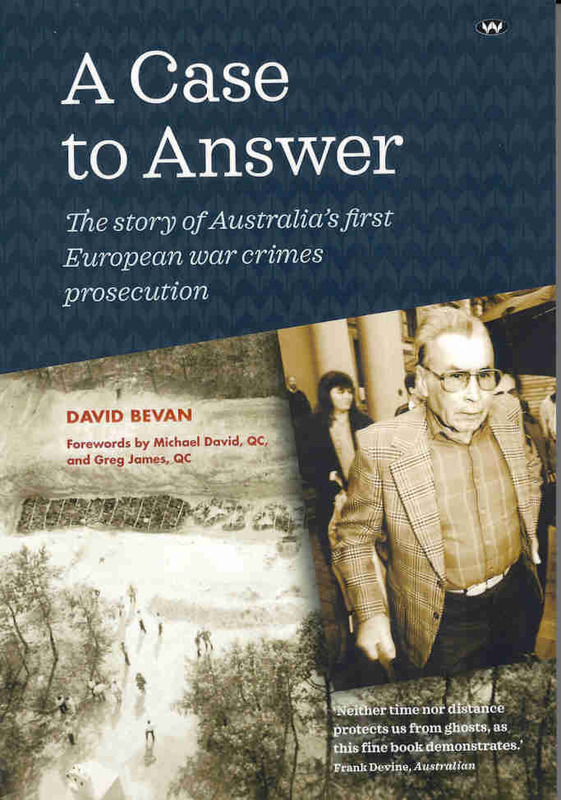 It tells the story of Australia’s first European war crimes prosecution. Over the years there has been much debate about prosecutions of these kinds of crimes. It also deals with the intriguing clash between historical opinion and the rules of evidence, as well as the lead up, narrative and consequences of the trial. It has been Bevan’s hope that his book will throw new light on the issues by giving an insight into the actions, thoughts and feelings of all those who were caught up in this remarkable case. On 1 September 1939 the second world war started with the invasion of Poland by Germany. It was followed in June 1941 by Germany’s invasion of Russia. About two months later some 100 Jewish men were executed by the Germans in the Ukrainian village of Serniki. A year later 850 men, women and children from the Jewish ghetto in Serniki were executed for no other reason than being Jews. After 42 years, on 26 December 1986, the Adelaide Advertiser received a telex from Soviet Ukraine outlining war crimes allegations against Ivan Polyukhovich, an Adelaide resident, originally from the Serniki area. It stated: Polyukhovich, 70, resident of Seaton, a township in the country’s south, was forest warden before the second world war. Serving in the Gebietspolizei under Nazi occupation. He killed several dozen civilians, mostly Jews, in 1942 and 1943, and took part in the shooting of 725 civilians in Serniki village. The many eyewitnesses, who now testify to the Nazi collaborator’s crimes, refer to him by the diminutive Ivanechko, as he was known in Alexandrovo and Serniki villages. After the war Ivan Polyukhovich spent four years in displaced persons’ camp before migrating to Australia in 1949. He became an Australian citizen and worked for 29 years with the Department of Marine and Harbours at Port Adelaide after which he retired. Under the legislation of that time there was little the government could or wanted to do. It took two years before the Crimes Amendment Bill was passed on 20 December 1988 which gave the government the power to act. The Special Investigations Unit now had a law under which charges could be laid. After lengthy investigations and interviews Polyukhovich was arrested on 25 January 1990 and charged the next day, Australia Day, with having murdered 24 people and having taken part in the murder of 850 Jews. It made headline news all over the world. The investigators had the difficult task of taking and recording statements from aged witnesses in the Ukraine and elsewhere. Before it was all over they had investigated and interviewed 813 people as well as conducted court proceedings in Russia, Ukraine, Israel, Canberra and Adelaide. The investigation included the exhumation by an Australian-Soviet team of a mass grave at Serniki containing more than a thousand bodies. During these investigations Polyukhovich apparently shot himself but survived and recuperated in the Queen Elizabeth Hospital for three months. On top of the prosecution’s problems was the funding of it all. About $11 million had already been spent and further funding was in doubt. During that same time the War Crimes Act was challenged in the High Court of Australia. It took until 14 August 1991 for the High Court to give its decision. Four judges were in favour and three against. At last the way was clear for the case to resume, even though the defence was still convinced that Polyukhovich was an old, frail and sick man. Now came the extra cost of bringing witnesses from Eastern Europe, America and Canada to Australia, provide them with hotels and pay for their incidental costs. Another added problem was the great social, cultural and economic differences in their backgrounds as well as the languages spoken by them. It was even hard on the interpreters. On 8 March 1992 Polyukhovich’s committal resumed with the first overseas witnesses. Most of it was oral evidence given by Ukrainian and Jewish witnesses who at the time of the war lived in a village occupied by the Nazis. The transcript of the six month committal ended up with more than 1600 pages. The length of the hearing was caused by the need to translate everything and to give Polyukhovich one day of rest each week to recuperate. When every witness had testified, the Magistrate committed Polyukhovich for trial on just six murder charges. All other charges were dismissed. On 1 March 1993 the pre-trial arguments began and on 18 March Polyukhovich’s trial before the Supreme Court Jury began. The trial involved never to be repeated issues confronting an Australian criminal court. There were also the forensic problems of identifying bullets and artefacts. The trial demanded the attention of expert historians who could give general evidence about the Holocaust in the Ukraine which included the interpretation of Nazi documents obtained after the war. There was the oral evidence given by Ukrainian and Jewish witnesses who at the time of the war lived in a village occupied by the Nazis. The author was senior court journalist for the Advertiser during the committal hearing and the trial, day by day. He has also been able to record the compelling stories, outside of their evidence, of many of the witnesses. He was able to capture the immediate courtroom atmosphere and the problems faced by all practitioners, including the judge. After more than three years, an extensive and complicated investigation, a lengthy committal hearing and an equally lengthy jury trial, the prosecution was ready to put its case to a jury. On 18 May 1993 they acquitted Ivan Polyukhovich of all counts of war crimes allegedly committed in the Ukraine during the second world war. Polyukhovich declined all requests for interviews. During the whole process he sat silently in court and because of his age, education, poor health and the language barrier, it seems likely that he understood little of what was going on during the three years of court proceedings. Both Michael David, QC and Senior Council for the defence and Greg James QC and Senior Council for the prosecution, highly recommend the book for its objective study and reporting of this case. Both men conducted the defence and prosecution with skill and professionalism notwithstanding the tension and world-wide interest that the prosecution of this kind engendered after being brought so many years after the event. Neither of them have any regrets that the Polyukhovich matter proceeded as both believed that it was appropriate for Australian courts to deal with the allegations in that impersonal and just way in which the courts of Australia have always operated. Although they lost the case, it was not a failure for the prosecution. As pointed out by Bevan, the legal and evidentiary hurdles in the way of the prosecution indicated that it was most unlikely that the evidence would survive long enough to produce a guilty verdict. In fact there was a substantial and important basis for the prosecution. Whatever the political motives behind the legislation, the prosecution was born of real suffering, and it was played out in court at great cost to the witnesses, the defendant and his family. Bevan was an eyewitness throughout the prosecution. According to Greg James the political failure to continue the prosecution of other suspects against whom the evidence may have been more substantial means that Polyukhovich remains the only Australian example of an international war crimes trial arising from the second world war and Nazi policies. For that reason the book is a valuable contribution to the forensic literature and provides remarkable insights into both the conduct of the court proceedings, the underlying investigation, the background politics to Australia choosing to lay charges and the eventual fate of the prosecution. A Case to Answer, PB, 260 pp.